I am: A third generation Philadelphian. I live, work, and play in Philly. I have lived in many neighborhoods in the city including Kingsessing, Parkside, Fairmont, Lower Moyamensing, and Pennsport. I blog about the South Philadelphia community on a facebook group page called South Silly. I’ve worked for the Painters and allied trades union of Philadelphia for 8 years. I currently work at the Barbary in Fishtown. On my spare time I enjoy spinning music, riding my bike throughout the city and walking my dog to the plethora of parks in and around my neighborhood. Years in Philly: On and of for 14 years. My love note: In ’93 my family moved out of Southwest Philly to South Jersey where I grew up, in the suburbs. That gave me the opportunity to become a boy scout and spend plenty of time camping and playing in the woods. As I grew older, the allure of moving back to the city became a daily commute. Upon moving my adult self back to the city, I longed for the hot summer days spent in the woods by creeks and rivers. 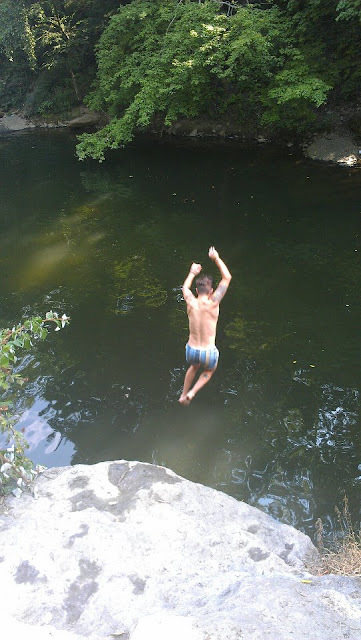 To me, there is nothing like getting the dog ready, filling a backpack with some beers, and heading to the woods with some buddies to go cliff jumping and swimming in the Wissahickon. Relaxing, fun, and adventurous. Meeting other people out there and watching dare devils doing back flips some 15-20 feet above the water with perfect execution and thundering splash is most definitely entertaining. Catch it during the week when its not so busy with a few close friends and you’ll have yourself a wonderful time. The surroundings can almost bring you back in time. This is why I love the Wissahickon Creek and Devils Pool.